Bomb Site at 101 High St.
During the night of 10/11 January 1941 Portsmouth experienced the heaviest raid by German bombers on the city during World War 2. Amongst the many buildings hit that night, which included the Guildhall and Garrison Church, was No. 101 High Street. Sheltering in the basement were a group of local people all of whom died when the building received a direct hit, as did others near by. The plaque commemorating the loss of life at 101 High Street was unveiled on the 70th anniversary of the destruction of the building. It was not however the first plaque to do so. 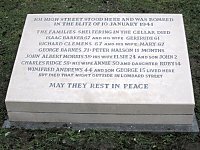 At some unknown date a small rectangular tablet had been set into the grass, so that it was almost invisible from more than a few feet away, and it read "In Memoriam, 101 High Street, 8 April 1941, R.I.P." It is not known why an incorrect date was used for the memorial though there was indeed another heavy raid on Portsmouth that day. 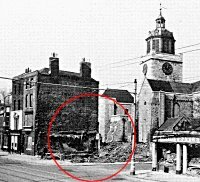 Portsmouth Cathedral made the same mistake in their booklet "Portsmouth Cathedral in the Blitz" where it is reported that a high explosive bomb fell on the corner of High Street and Pembroke Road on the night of 10th January 1941. It then goes on to say that on 8th April 1941 incendiaries fell on 101 High street which had been damaged in the raid of 10th January and that the inhabitants were trapped in the basement and died. The replacement plaque was paid for by local people who wanted the record to be set straight as well as to record the names of the dead in a respectful manner. 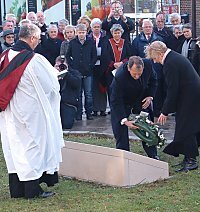 It was unveiled at the end of a commemorative service at the Cathedral, during which students from Portsmouth High school read memories of local residents of the night of 10 January 1941. They were followed by Roger Halson who reflected on the losses suffered by his family that night. "Growing up as a boy in Portsmouth immediately after the war I did not really appreciate what had very recently happened in the City. 'Prefabs' were just a different type of house where friends lived, and 'bombsite' was an open piece of ground where you would go and play. Indeed it was years later, when I had a family of my own that the enormity of it all really sank in. What my sister and I know of the events of the fateful day is what we have gleaned from our mother. My father was out fire-watching that night so my mum took baby Peter, my older brother, to her parents, Charles and Annie Ridge, at 101 High Street to shelter with them and her younger sister Ruby and other local residents. The family were all together except for her brother Eric who was at sea, and her sister Win who was in Grimsby with her husband who was serving in the RAF. Life and death then was a matter of tiny margins. It transpires that my mum needed the toilet so she left the basement, but her dad went with upstairs with her to look after her. Then the house took a direct hit. All of the people in the basement were killed as was my grandfather. However, my mum was blown clear of the building but buried and badly injured. It was only the heroic efforts of the rescue workers that saved her, and the three generations of us that have followed on. Needless to say we are very grateful to them. It is not clear what happened to our relatives bodies. Records show that the victims of 101 High Street were buried at Kingston Cemetery, but my mum always believed that our family were buried here in the gardens of the Cathedral. Examination of records suggests that this may be the case as the family were not included in the records of those buried at Kingston. My mum told us that my dad identified Peter, his baby son, by only a booted foot. Her brother Eric was brought back after the tragedy and visited the scene but was never seen again. All her life until she died in 1997 my mum wondered what happened to Eric, she had a feeling he went Australia but could not say why. How on earth did people cope with these events? On that night my mum lost her parents, sister and first born baby son and was badly injured; while my dad was faced with his badly injured wife and the identification of the remains of his family. Those of us that were not there will never understand, especially nowadays with all of the support networks that are provided for victims. But life did go on. Two years later in Yorkshire where my mum was evacuated my sister was born and then, back in Portsmouth, in 1948 I followed on. We enjoyed a normal, happy family life - that is until my dad died in January 1958. As parents to us they never showed the scars of the experience, although for the rest of her life my mum was claustrophobic and always made us promise that when she died she would be cremated not buried! There was a strange turn of events in Spring 2004. We took a phone call from a woman in Sydney Australia. She asked me if I knew who Eric Charles Ridge was as she was his daughter and that he was alive and well! What a bitter sweet moment to realise that after all these years Uncle Eric was still alive, but that my mum died never knowing what happened to her brother. As a further twist I was a senior manager in HM Customs and Excise and a year later was sent to Sydney and Canberra for discussions with the Australian Tax Office and so I got to meet Eric. But like my mum and Win's husband, Uncle Joe, he was not prepared to discuss the war or his past and my Australian cousins told me that he still suffered flashbacks. They also told me that for the rest of the war he volunteered for every dangerous mission with almost a "deathwish". He survived but was traumatised by the war. So that is our story, a family literally blown apart by the bomb that hit 101 High Street. It is a very strange and emotional feeling standing here today exactly 70 years after those events knowing that we are literally a few feet away from where they sheltered and died. I speak for all of the family when I express my gratitude to those who have kept alive the memory of this particular tragedy and to Terry Halloran in particular for his efforts to raise a new memorial. Thank you." The replacement of the Memorial has been made possible by the generosity of local people and The Friends of Old Portsmouth; the help and knowledge of Dr John Stedman / the Portsmouth Museum, Tim Backhouse, Bob Hind and Chris Owen of The News, the support of the RN & RAYC, Robin Kay / XpressFM, Richard Jones / Meridian TV; Pippa Cleary of PGS, Jan Cresswell and PHS, Ian Young / The Dolphin, Emma Dunaway / Eden Florist, Vikki Matthews / D M Nesbits, the leaflet by Anita Stepnitz and printer Michael Walter, the skill and support of the stonemason John Woolnough, also all here today and most importantly the generosity and original idea by Tony Voaden. Thanks also go to all those who donated: Georgie Affleck-Graves, Bob Adderley, John & Anne Albery, Brenda Barron, Tim Backhouse, Bret Bailey, Nan Barnard, Paul Bass, Gordon Baxter, Jackie & David Baynes, Chris Blow, Mrs J Bond, Mrs Bowker, Pat Carter, Ron & Sue Chequer, P Chiles, S Clark, Celia & Deane Clarke, Mr L Clarke, Alex Cleland-James, Sarah & Brian Davies, Beryl Denny, Rosemary Dunne, Joan Eddings, Rosemary Fairfax, Sally & Steve Farnfield, Cllr. Jason Fazackerley, Keith Feltham, FOOPA, Freda & Brian Forcey, Marianne Forrest, Joyce Foster, Margaret Francis, John & Jeannine Galley, Frank Godkin, Jim and Valerie Gray, Chris & Dulcie Green, Mr DV Griffiths, Heather Greaves, John & Nicky Gummerson, Mrs JMS Hall, Cllr. Terry Hall, Andrea & Terry Halloran, Denise & Roger Halson, Joan & George Hancock, Philip Haskell, Jackie & Phil Heckford, Joyce Hedley, Neville Hill, Mary & Andy Hind, JD & ME Hopkinson, Judy Howard, Doreen Huffell, Derek & Dorothy Hunter, Mr & Mrs Jackson, Gill Jarrett, Cllr. Frank Jonas, Robin Kay, Mr RC Knighton, Elaine Knowlesley, Sir Robin Knox-Johnston, Gillian Laughton, Helena Lee, Rebecca & Robert Lewis, Marnie & Julian Linington, John Littlefield, Margaret Lord, Mags & Chris Lovett, CV & ELE Martin, Vikki Matthews, Jan & Bill Mayes, Sinah & Ian McMaster, Diana Mitchell, Restaurant Montparnasse, Penny Mordaunt MP, Vennie Nash, Rosemary Niner, Lloyd James O'Hara, Judy Pellat, Nikki Pembleton, IJ Newman, Lesley & Aidan Nugent, Mr DW & Mrs MJ Pafford, John Sadden/Portsmouth Grammar School, Jenny Clough/Portsmouth High School, Edna Rea, Dorothy & Malcolm Reeves, Lis Richards, Betty & Peter Richmond, Sheila Robinson, Kate Roch, Fiona & Martin Rosen, Angus Ross, Dr & Mrs Shaw, Mr RP Simons, Diane & David Smith, Jeanette & Dave Smith, Geoff Smith, MB Smith, Barbara & Richard Stanley, June Stanley, Rosina Starkie, Dr John Stedman, Anita Stepnitz, Sgt. Darren Stiles, Sandra Stockdale, Helen & David Swann, Martin Sykes, Hilary B Thomas, Lesley Tyler, Mr D & Mrs M Underhay, Cllr. Gerald Vernon-Jackson, Diana Villar, Val & Tony Voaden, Mrs Wallis, Jo Warsop, Coral Webber, Mrs IH & Mr PJ Weeks, Anthony Welch, Eve & Ray White, Cllr. James Williams, Mr & Mrs Wilkinson, Margaret Wilson, Cllr. Rob Wood. There is some uncertainty about what happened to the bodies of the dead as the Portsmouth Cemetery Manager can only confirm that Isaac and Gertrude Baker both died on 10 January 1941 and were buried on 17th in the common grave for civilians on the west side of Kingston Cemetery. There seems no obvious reason why all 14 were not buried together, but Bob Hind reports in his "City of Gallant Hearts" that Richard and Mary Clemens were buried on the 20th January in Milton Cemetery. Their grave was not marked however and was re-used some years later. The other names do not appear in the cemetery records within a week or two of the incident. This could mean that they were buried outside Portsmouth or that they are numbered amonst the 'Unidentified' in the Civilians Grave.